The Larson Electronics ATEX-EPL-RPS-70A-220V explosion proof power supply enables operators to power low voltage LED lights via four Class 1 and 2, Division 1 and 2 receptacles. 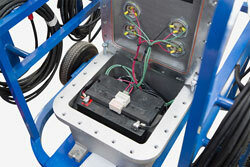 Once the encapsulated 70ah sealed lead acid battery is depleted, operators can plug this unit into an explosion proof outlet to charge the unit overnight within the hazardous location. This ATEX-rated unit features an input voltage of 220V AC 60 Hz. When paired with Larson Electronics’ EHL-LED explosion proof LED hand lamps, operators can run 4 hand lamps for 10.5 hours on a single full charge. The ATEX-EPL-RPS-70A-220V explosion proof portable power supply is built to provide operators in hazardous locations with a method of power low voltage hand lamps with 12 or 24 volts DC output. This unit, comes with an input voltage of 220V AC 60 Hz and includes four explosion proof receptacles rated at 20 amps each. 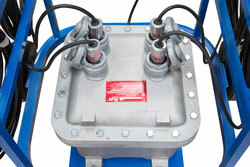 This ATEX-rated compact power distribution system is designed for portability and convenience as well as durability and is mounted to a wheeled, non-sparking aluminum frame for added protection. The output side is equipped with four 2023, Class 1, Division. 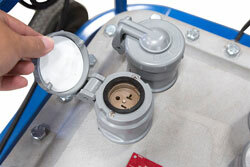 1 receptacles designed to accept twist lock plugs like our EPP-15A and EPP-20A explosion proof plugs. 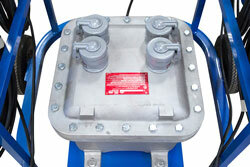 The explosion proof enclosure contains a 70ah AGM battery and charger/maintainer systems. This explosion proof battery system comes standard with a 25 foot, 16/3 SOOW cord terminated with a 20 amp 250V 6-20P explosion proof male plug. The ATEX-EPL-RPS-70A-220V is designed to be charged withinATEX-rated and Class I, Division 1 classified areas.